INAN, East China, Oct. 19 (Xinhua) -- Chinese hurdler Liu Xiang's much-expected race at the 11th National Games would help boost ticket sales at the Olympic Sports Centre, organizers said on Monday. 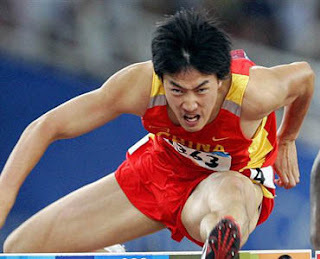 Liu was due in the starting blocks for the 110-metre hurdles heats on Saturday and finals on Sunday if he goes on wheels. Piao Wutong, a ticket sales official with the organizing committee, told Xinhua that the ticket sales has reached another peak at the Games after diving queen Guo Jingjing hit the box office in the event which was held prior to the official opening of the national meet. "Up to now, 64% of the 110-mater hurdle finals' tickets have been sold out. The best viewing seats have all been sold. It is the highest figure among the six-day track and field events." he said. The race at the National Games, China's top national-level sport gala, will be Liu's second formal race since he limped out of the Bird's Nest last year at the Beijing Olympics, leaving supporters shocked and heartbroken. However, 13 months later, the Athens Olympic champion thrilled the home town crowd in last month's Shanghai Golden Grand Prix with a strong comeback, crossing the line neck and neck with American Terrence Trammell. Judges awarded Trammell first place but Liu's time of 13.15 was unexpected as the former world record holder received an operation in December to repair the achilles tendon which caused his with drawin Beijing. The six-day athletics events, slated for Oct. 21 to 26, will produce 44 gold medals.